A stretch of mangrove and mudflat extends 200 km east of Panama City in the Republic of Panama. In some places, at low tide, the mudflat extends out an astonishing 4 km. In other places, where the wetland sits right next to a metropolitan area of over 1.5 million people, the mangroves are literally shadowed by condominium towers. This is the Bay of Panama. [caption id="attachment_11616" align="alignnone" width="700"] Part of the Bay of Panama showing the recently grown mangrove fringe and the offshore mudflat. (photo: Karl Kaufmann). [/caption] It is said that the word Panama is derived from an old indigenous word meaning abundance. The Bay of Panama lives up to its name. This wetland supports over a million shorebirds annually1. It is one of the most important sites for migratory shorebirds in the Western Hemisphere and it is a designated a site of Hemispheric Importance in the Western Hemisphere Shorebird Reserve Network (WHSRN) and a Ramsar Wetland of International Importance. In this issue of Wader Study, Kaufmann and colleagues from the Panama Audubon Society describe 5 years of monitoring work on this incredible wetland2. They recorded 23 species of birds and estimated winter peak counts totaling more than 300,000. That is a lot of birds to count over long stretches of coastline. How did the researchers manage to census (count and identify) all those birds over such a large area? First, they divided the larger area into sites and subsites that could be accessed from the ground by foot or car. This yielded three main sites: Panama-Juan Diaz, adjacent to Panama City, Pacora-West just to the west of the Río Pacora, and Pacora-Chico between the Río Pacora and the Río Chico. They then divided these sites into 26 subsites covering a total of 21.2 km between Panama City and the Río Bayano. These sites are also part of the Migratory Shorebird Project, composed of partners from 12 countries along the western flyway. By breaking the sites into subsites and with the help of a few volunteers the Panama Audubon staff could census all three sites with teams of two to four people during 5 to 6 neap tides in January and early February from 2013 to 2017. Surveys began when the rising tide pushed birds off their feeding grounds 500 to 4000 m offshore to within 300m of shore where they could be counted. Neap tides were used to provide the maximum amount of time for birds to be within 300m of the shore and so that the exposed mud in front of the mangroves would be dry enough to walk on. To help with counting shorebirds of different types, the researchers also classified species into groups by size: small, medium and large. The details can be found in Table 2, but examples of small shorebirds include Western and Semipalmated Sandpiper, of medium shorebirds include the Black-bellied Plover and Short-billed Dowitcher and of large shorebirds include Willet and Whimbrel. Most birds were generally counted one-by-one, but to count the huge numbers of small birds, up to 200,000 in a flock, the researchers counted them in groups of 100 usually with a scope and using a hand-held tally counter. During one survey at the Pacora-Chico site the birds sat still long enough for the researchers to take a series of 51 overlapping telephoto pictures (which they estimated to cover about two thirds of the birds present at that site). They digitally stitched the photos together, superimposed a grid, and counted the birds that way. They took this to be their best estimate of numbers at that site. It is notable that Kaufmann and colleagues chose to census birds during the northern winter. Shorebirds are most abundant in the Bay of Panama during fall migration and most bird monitoring has taken place then1,3,4. Yet Kaufmann and colleagues point out that fall numbers are constantly changing as birds pass through, whereas winter monitoring provides data on a relatively stable population for the season and a good estimate of the local wintering population. It can also serve as an index of habitat quality for all seasons. The authors report that small shorebirds were the most abundant shorebird type in the bay comprising 95.5% of all shorebirds counted over the five years. This group of small sized birds was about 68.7% Western Sandpipers, 14.1% Semipalmated Sandpipers and 13.5% Semipalmated Plovers. The remaining birds were all medium or large shorebirds composed mainly of Whimbrel, Marbled Godwit, Willet, Black-bellied Plover, and Short-billed Dowitcher. [caption id="attachment_11617" align="alignnone" width="700"] Birds of different sizes in front of new mangroves at the Panama-Juan Diaz site. In the right foreground are Marbled Godwits and Willets. The smaller shorebirds are Western and Semipalmated Sandpipers and Semipalmated Plovers. (photo: Karl Kaufmann). [/caption] An interesting finding of the study is how the birds distributed themselves over the shoreline west to east and urban to rural. Four of the five common medium and large species, Marbled Godwit, Willet, Black-bellied Plover, and Short-billed Dowitcher were concentrated closer to the city at Panama-Juan Diaz in the west. In contrast, small shorebirds were almost 15 times denser (linear density) at Pacora-Chico about 20 km east of Panama-Juan Diaz. This uneven distribution might mean that different species have different high tide habitat preferences. Panama-Juan Diaz, which large and medium sized shorebirds seemed to prefer, is now an urban site. Over the past 30 years the proportion of coastal mangroves has increased, going from mangroves occupying 51% of the coast in 1987 to 89% in 2016. The biggest changes happened between 2003 and 2013, when low lying wetlands inland from the coast were filled in and developed. During this period, the entire shoreline advanced seaward by 150 to 300 m, including part of the waterfront of the oldest part of the city, Panama Viejo, founded in 1519. This filling and development, coupled with sand mining up to and including the channel of the Río Pacora likely provided the source of sediment that fueled the seaward advance of the coastline and the growth of mangroves. The new mangroves may provide attractive roosting areas for Willets and Whimbrels at high tide and paradoxically insulate them from human disturbance. The mudflats seaward of the mangroves are often inaccessible compared to the beach at Pacora-West, which still has an active sand extraction operation, or the beach at Pacora-Chico which fishermen commonly drive along. While this urban habitat may attract large and medium sized shorebirds, it may also expose them to higher levels of pollution than they would experience farther from the city. At high neap tides the small shorebirds prefer the mudflats adjacent to the beaches without mangroves at the Pacora-Chico site further east. This site has been relatively unchanged in terms of mangrove coverage which was 14% in 2000 and 12% in 2016. Large numbers of small shorebirds once roosted in the low-lying, but mangrove free, wetlands closer to the city, but these have been developed into condominiums and subdivisions. The tall buildings now adjacent to Pacora-Juan Diaz, but absent at the other two sites, provide roosting areas for overwintering Peregrine Falcons which are known to drive shorebirds away from otherwise acceptable sites. [caption id="attachment_11618" align="alignnone" width="700"] Western and Semipalmated Sandpipers and Semipalmated Plovers at the Pacora-Chico site in the foreground and Panama City in the background about 20 km away. (photo: Karl Kaufmann). [/caption] Western and Semipalmated Sandpipers and Semipalmated Plovers at the Pacora-Chico site in the foreground and Panama City in the background about 20 km away. (photo: Karl Kaufmann). A final question is whether the total number of birds using the monitored area changed over time. In the five-year study, Kaufmann and colleagues found no change in the populations of any species except for Marbled Godwit, which decreased. Over the longer term, they found more shorebirds than expected for the winter period, compared to numbers found over larger areas in a previous aerial survey in the fall of 19933. However, it is difficult to determine whether this is due to differences in methodology or to actual population changes. Regardless, this research shows that the Bay of Panama hosts more winter birds than previously understood and that it remains an important area for shorebirds. Watts, B.D. 1998. An Investigation of Waterbirds within the Panama Canal Zone and the Upper Bay of Panama (lay summary). 68 pp. Center for Conservation Biology, College of William and Mary, USA. Kaufmann, K., R. Miró, Y. Díaz, M. Caballero, S. Carty & Panama Audubon Society. 2018. Monitoring winter shorebird populations in the Bay of Panama – 2013-2017. Wader Study 125(2): 97-106. Morrison, R.I.G., R.W. Butler, F.S. Delgado & R.K. Ross. 1998. Atlas of Nearctic shorebirds and other waterbirds on the coast of Panama. Canadian Wildlife Service, Ottawa. Buehler, D.M., A. I. Castillo & G. R. Angehr. 2004. Shorebird counts in the Upper Bay of Panama highlight the importance of this key site and the need to improve its protection. Wader Study Group Bulletin 105:56–64. The refuelling quality of stopover sites of temperate zones determines the ability that long-migrant arctic shorebirds can cope with climate-related changes in the Arctic. That is the main insight coming from the paper of Eldar Rakhimberdiev (NIOZ Royal Netherlands Institute for Sea Research, Lomonosov Moscow State University) and his co-authors from Netherlands, Russia and Alaska recently published in Nature Communications: Rakhimberdiev, E., Duijns, S., Karagicheva, J., Camphuysen, C.J., Dekinga, A., Dekker, R., Gavrilov, A., ten Horn, J., Jukema, J., Saveliev, A., Soloviev, M., Tibbitts, T.L., van Gils, J.A., Piersma, T., van Loon, A., Wijker, A., Keijl, G., Levering, H., Jan, V., Heemskerk, L., Knijnsberg, L., van Roomen, M., Ruiters, P., Admiraal, P., Veldt, P., Reijnders, R., Beentjes, W. & Castricum, V.R.S. (2018) Fuelling conditions at staging sites can mitigate Arctic warming effects in a migratory bird. Nature Communications, 9, 4263. 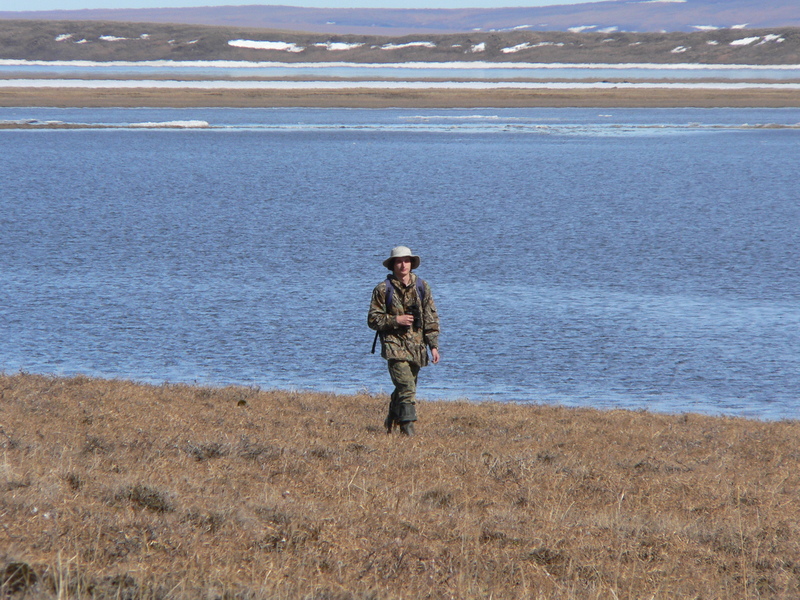 In their study, the researchers focused on the effect of advances in Arctic phenology on spring schedules and, possibly, population dynamics of godwits at the flyway scale of the taymyrensis population. They show that due to climate change, Godwits need to arrive earlier and earlier in Siberia each year in order to match with the peak abundance of insect. Whether or not they are able to adjust their time or arrival is determined by the density of their main prey (i.e. lugworm) at their stopover, the Wadden Sea. [caption id="attachment_11543" align="aligncenter" width="494"] The paper of Rakhimberdiev et al. is somewhat unique, combining various long-term data set (i.e. satellite transmitters, overwintering prey, arctic breeding conditions, survival analysis, spring schedules) gather along a whole flyway of a long-distance migratory shorebird. Figure retrieved from Nature Communications at https://go.nature.com/2pSNR3p. [caption id="attachment_11453" align="aligncenter" width="330"] Spoonies in keeping box, ©Saving the Spoon-billed Sandpiper. [/caption] Featured image: Spoon-billed Sandpiper, Calidris pygmaea.®JJ Harrison, Pak Thale, Petchaburi, Thailand, January 2013. Lesser Sand Plover samples from across its breeding range in east Russia and from Central Asia to China. For significant contributions, we will be happy to confer co-authorship. For both studies, Next-Generation sequencing approach (ddRADSeq) will be applied. This technique yields thousands of loci from throughout the genomes of these birds, but will require rather good DNA quality samples. Blood and muscle tissue or organ tissue samples would be best, but feathers sometimes also work if they are large and sturdy – such as large primaries and rectrices. Interested contributors can get in touch with Dr Frank Rheindt (dbsrfe@nus.edu.sg) for more information and before samples are sent. A completed treatment letter with respective institution letterhead will be required for import permit application and can be downloaded at our lab website: https://avianevonus.com/documents/. Shipments should always include the original treatment letter and import permit. Sample shipments can be addressed to: Dr Frank Rheindt Department of Biological Sciences S3 Level 4 National University of Singapore 16 Science Drive 4 Singapore 117558 Republic of Singapore [caption id="attachment_11382" align="aligncenter" width="330"] Lesser Sand Plover Charadrius mongolus, April 2012, Laem Phak Bia, Phetchaburi, Thailand. ©Jason Thompson[/caption] Featured image: Common Redshank Tringa totanus, April 2017, Lake Geneva, Wisconsin, USA. ©Christoph Müller. Dr Andras Kosztolanyi (andras.kosztolanyi@gmail.com) [caption id="attachment_11353" align="aligncenter" width="330"] kentish plover Charadrius alexandrinus, ©Chung Yu. [/caption] Featured image: Northern Lapwing Vanellus vanellus, July 2018, Finland. ©Guillaume Bigayon. Visit the official website of the World Shorebirds Day to learn more about this event set for raising public awarness about the importance of shorebird conservation at: https://worldshorebirdsday.wordpress.com/ The counts will be carried out between 5–11 September 2018. Registration and reporting process are very simple to handle. All you have to do then is birdwatching! Have a nice World Shorebirds Day! Featured image: Kentish Plover, Charadrius alexandrinus, 20-April-2018 Somme Bay France ©Guillaume Bigayon. Jeroen Reneerkens reports about his remarkable 2018 field season in NE Greenland where excessive spring snowfall results in a non-breeding year for shorebirds. "What are the consequences of a non-breeding season for the Sanderling population??? This will depend on the scale at which the snow cover has affected Sanderling reproduction": Jeroen calls for a renewed effort on reporting the proportion of juvenile Sanderlings within flocks between August and November, following his standardised protocol. Read the full story "Excessive spring snowfall results in a non-breeding year for shorebirds in NE Greenland" on Global Flyway Ecology website: Featured image: 27 June 2018, the Zackenberg valley, Greenland. ©Jeroen Reneerkens. Registration for 1.5 day workshop at the IOC congress in Vancouver, 19-20 August 2018, is now open! If you are interested in attending the course please visit this signup page to provide your contact information and to answer a few quick questions about your coding background. Our apologies for the late notice but we want to announce that there will be a 1.5 day short course in geolocation analysis in association with the International Ornithological Congress in August. We have been unable to come to terms with the IOC organizers about the location of this course, but one way or another we will have it in Vancouver on August 19 (Noon to 6pm) and August 20 (8am to 5pm)—just before the conference. It is uncertain as to whether this course will be listed on the IOC website, so we wanted people to be aware of it as they make travel plans. Please share this announcement with anyone who may be interested. We have no intention of excluding anyone. For more details on the contents of the course, please see the attached description. We will probably ask for a $20 fee at some point to cover any room rental fees and other expenses (and to discourage no-shows). We have limited the course size to 40 attendees. If you have any questions, feel free to contact any of the organizers. For those of you going to IOC we look forward to seeing you there. To everyone else, please excuse the intrusion. Workshop on Solar Geolocation at IOC 2018 in Vancouver | Registration is now open!